Are all of Your Drugs Covered? Find out if you qualify for Medicare Extra Help. Have you heard of LIS (Low Income Subsidies)? You may have heard it called “Extra Help.” It’s a federal program that helps seniors and medicare eligibles save money on their prescription drugs, and thousands of eligible people don’t even know about it! On average, seniors and Medicare eligibles with LIS save almost $4,000 per year on prescription drugs. When you're in the program, you won't pay more than $3.40 for generic drugs and $8.50 for brand-name drugs. Are you eligible? The Medicare Extra Help Program, or LIS, helps cover your prescription drug premiums, deductibles, coinsurance, and co-payments. By qualifying for LIS, you will also qualify for a Special Enrollment Period. That means that you will have the ability to make changes to your Medicare coverage during any month of the year instead of having to wait until the Annual Enrollment Period like everyone else. Additionally, LIS can eliminate your Part D late enrollment fee (if you have one). People who waited too long to enroll in Part D may face up to a 10% premium increase, but LIS can remove that extra fee. Medicare subsidies also provide coverage in the Donut Hole. The Donut Hole is a coverage gap that almost every Medicare beneficiary will face. It means (in 2019) that once you spend $3,820 on prescription drugs, you enter a coverage gap known as the Donut Hole. While you’re in that gap, you have less coverage than you did before. You'll be responsible for 25% of your brand-name drug costs and 37% of your generic drug costs. That will end once you've spent $5,100, but that extra $1280 can be detrimental. LIS can protect you while you're in that gap. There is a plan in place to decrease that 37% to 25% as well in 2020, which would effectivley end the donut hole. For now, enrolling in Extra Help can help reduce those costs for you. If you don't qualify for Extra Help now but think you might qualify soon, you can always re-apply at any time. It's common for people to qualify later in life by experincing a change in resources. Resources can include money in savings, stocks, IRAs, and bonds. For example, you might qualify in a few years if your income stays the same but your savings account decreases to below the LIS limits. Each year, certain Medicare participants will receive a letter from the Centers for Medicare and Medicaid Services (CMS). Some of these letters can directly affect your benefits, so it’s important to open them and respond immediately if required. 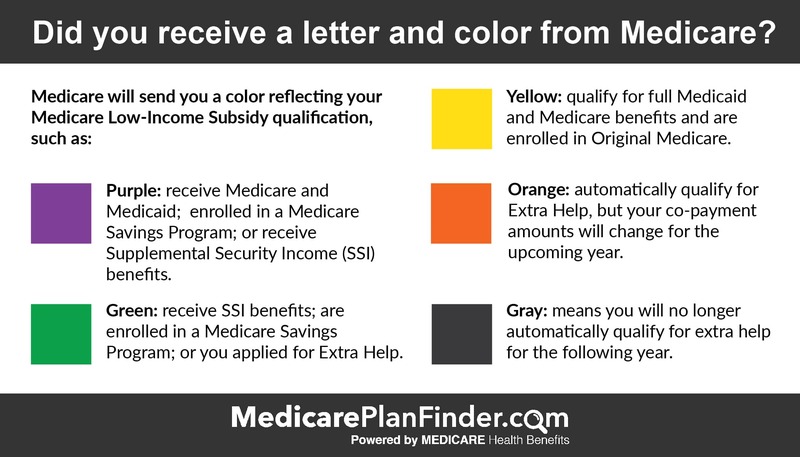 Purple: You automatically qualify for Medicare Extra Help because you receive Medicare and Medicaid, are enrolled in a Medicare Savings Program or receive SSI (Supplemental Security Income) benefits. 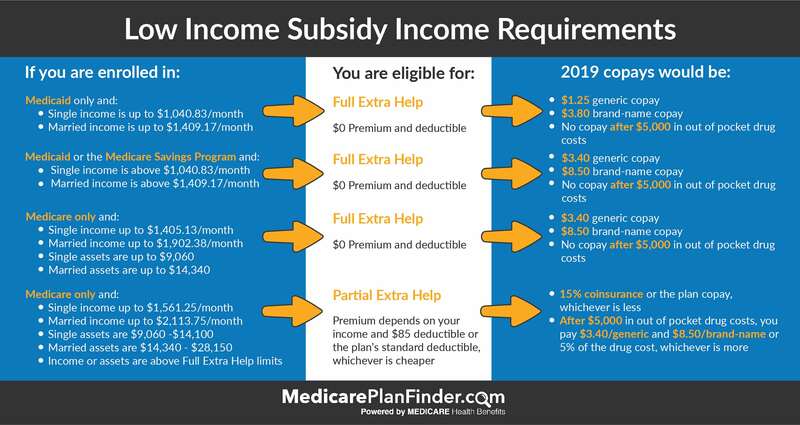 Green: You are automatically enrolled in a Medicare Low Income Subsidy program because you receive SSI (Supplemental Security Income) benefits, are enrolled in a Medicare Savings Program or you applied for Medicare Extra Help yourself. Yellow: You qualify for Medicare and Medicaid and are enrolled in Original Medicare. Medicare will enroll you in a prescription drug plan unless you purchase your own plan or choose to decline. Orange: You still qualify, but your copayments will change next year. Gray: You no longer qualify but are encouraged to apply for the following year. Visit the Social Security Administration website to complete the Medicare Extra Help Application. Once you apply, you'll need to enroll in a Medicare Part D (prescription drug) plan. If you do not select a plan, one will be chosen for you. You may need to re-apply for Extra Help every year, because your income and resource levels can change. To complete your application, you may need to gather some paperwork. Locate some current bank account, credit union, or other financial instutition statements first. You'll also want any statements from investments, stocks, or bonds, pension letters, life insurance policies, tax returns, and pay statements. You may also need your passport, driver's license, and/or birth certificate or other proof of citizenship and identity. If you recieve Medicaid, are a part of a Medicare Savings Program, or have any other government benefits (like Social Security), you may need proof of that as well. If you were automatically enrolled in Extra Help due to your Medicaid, SSI, or Medicare Savings Progrma benefits, and you still have those benefits, you will not have to re-enroll each year. If you applied by yourself because you do not have Medicaid, SSI, or an MSP but still qualify, you may have to re-apply. You will recieve a notice in the mail sometime in the fall season explaining that your Extra Help benefits will end on December 31. To keep your Extra Help, you'll have to complete the attached application and send it back before the deadline (or re-apply online). Not sure if you’re eligible? Give us a call and we may be able to help. We can find an agent in your area to help you fill out your application (at no cost to you) and answer all your questions about Medicare and prescription drug coverage. To get started, give us a call at 833-438-3676.